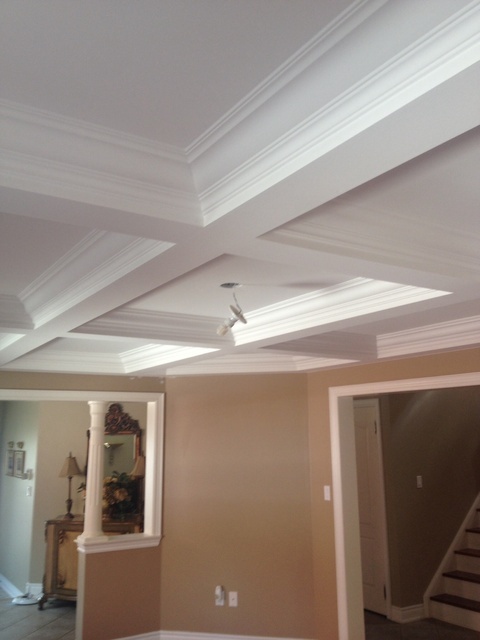 Reviews for Maestro Mouldings Inc.
We just had the coffered ceiling and wainscoting done in our dining room and foyer/hallway. I have been using Alex (who also goes by Sasha) and his team a few times now and they are hardworking and very talented team. We were a little uncertain on how it would look so Alex reassured me that it will look beautiful and it did!!! Alex and his team are highly skilled professionals and display the highest standard and quality in workmanship and perfection. Thank you Alex and team for a fabulous job. Thank you Vito for your review. I am very pleased that you are happy with the quality of workmanship me and my team provided you with. I look forward to help you with your future projects. Maestro Mouldings did a superlative job in customizing a wainscotted panel to cover an outdated and worn stainless counter in my restaurant. They also designed a beautiful custom cashier stand to coordinate with the counter. Alex is a highly skilled professional who displays an impeccable standard in workmanship, accountability and integrity. I would urge anyone who is considering using his services to come to Crepes a Go Go 18 Yorkville Avenue which showcases his splendid work. Dear Sylvia. I appreciate your positive feedback about our work. We do take pride in serving to our customers' needs the best way we can. It was pleasure to work with you. P.S. Thank you for the best crepes that I ever tasted in Toronto. Alex and his staff are hardworking. We did the search before the job. Compare to others, Alex gave a reasonable quote. Did a very clean job, the floor is fully protected. He started really early in the morning to make sure the project is done on time. The living room looks fatastic after the job. Thank you Alex. Alex and his team did a fabulous job. They completed the work professionally and in fewer days than what they had originally estimated. Thank you Alex and team for completely changing the look and feel of our living area! Thank you so much Rahim!!! Quick quote, Quick Deployment, Quick Job, Reasonable price. I would recommend for crown moulding.They also accommodated a tight space and schedule. I also compared him to others and they were all significantly more. Bruno thank you very much!!! Maestro Molding just finished work at my house and I must say that they are most professional people that I have ever met. Before I started with my project I took a few estimates. One of the rooms was a two storey open room with angled ceiling. Only Alex said that he can do this molding with no problem and it will look beautiful. Other two companies did not even know how to make it work…. Also, Alex did very beautiful door openings with columns and header. Amazing!!! After watching them work as a team and truly enjoying their job, which you do not see often, I have added baseboards and crown moldings for the rest of the house. Their quality of work is the best you can get. They are very polite and totally focused on the work they do. Thank you Alex and the other team members. You are the best! Thank You Yana for your review. We are very happy that you'r enjoying the work that we've done for you. We always offer many creative solutions. Because We've been in business for many years We have many solutions to many problems the homeowners have when it comes to making awkward areas beautiful. We always make it beautiful. I look forward to working with you again. Alex and Maestro Mouldings Team. It remained a debacle for us whether to do crown molding plus or minus wainscoting, so we decided to get quotes from few professionals. As we researched on our own as well, we were expecting certain price range, but the quotes we received seemed to be quite inflated. 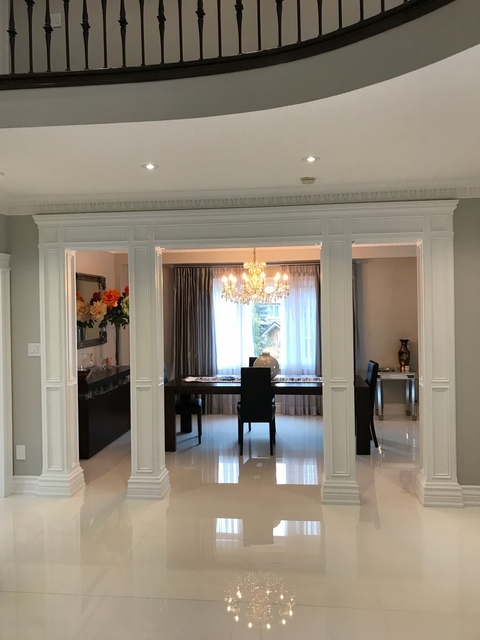 We thought of calling one more person and there comes Alex from Maestro Moldings with truly detailed measuring of the work involved and DOWN-TO-EARTH, REALISTIC AFFORDABLE QUOTE. And to our surprise, his work was also very prompt, neat, and immaculate with highly professional work. We are very happy with his work. Thanks Alex for such a wonderful job! Thank you Nalin! We are happy that you satisfied with our work. Our primary goal is to make each of our customer happy. Thank you again, Alex. thank you Paul for the kind words, we happy you satisfied with our work. Alex was always professional and showed up on time. I called most of the high ranking companies on home stars. His quote for the project was competitive and his positive attitude made his company the easy choice. His team was very talented, professional, extremely hardworking, and worked quickly and efficiently to get the job done on schedule. I'm extremely happy with all the work they've done! To anyone looking for a quality mouldings at a fair price hire Maestro Mouldings. Artur Nikolaev Thank you very much for trusting our company to do your project. It was a pleasure working for you. We appreciate you for taking time to review our company. Alex and his crew did a fantastic job. 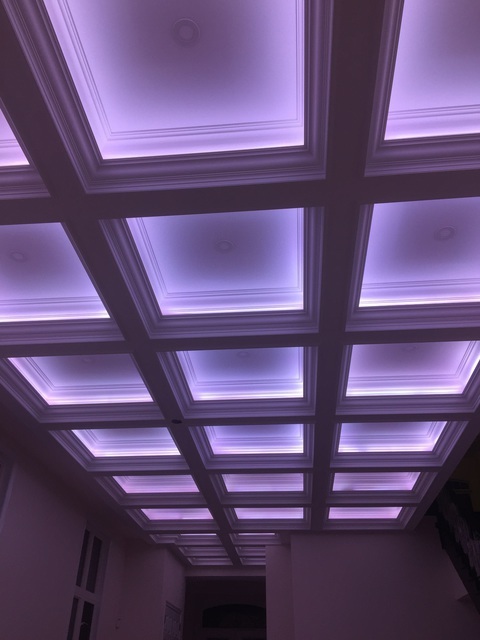 We researched other companies for coffered ceiling and it turned out that Alex took the most time and attention to detail . The end result was a beautiful ceiling that we are now happy to look at every day... Thanks Alex! I recommend Alex and Maestro Mouldings to anyone who wants professional work done at an affordable price. Rob Thank you for the kind words. 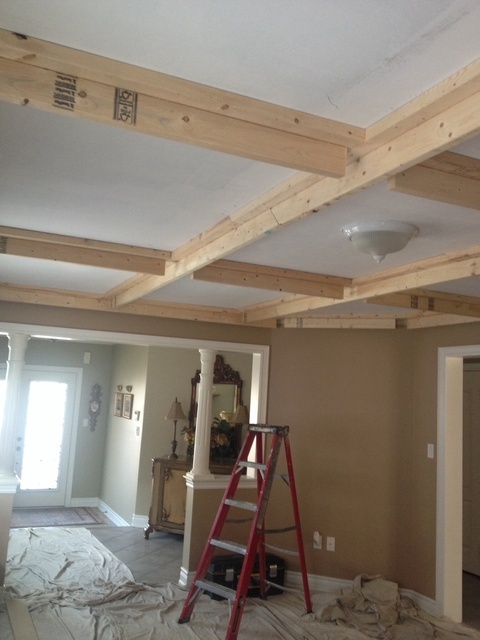 We are glad that the coffered ceiling matched the beauty of your home. Our main goal make each and every client happy with our work. More about Maestro Mouldings Inc. 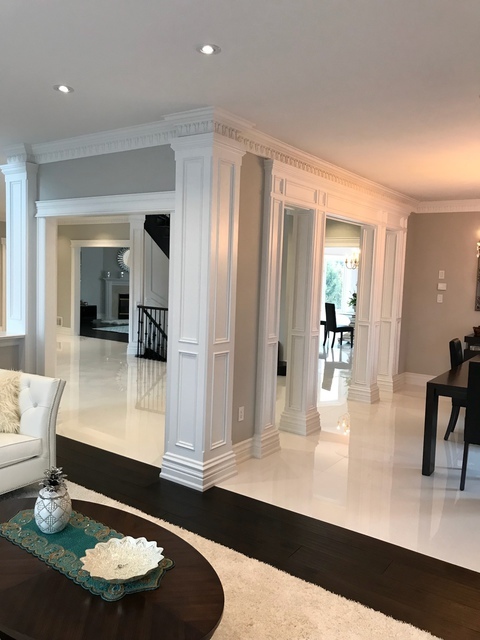 Maestro Mouldings is a Toronto based mouldings installation and interior painting company that provides service all throughout the GTA, North York, Thornhill, Vaughan, Richmond Hill, Woodbridge, Maple, Brampton, Mississauga, Etobicoke, Scarborough, Markham, Pickering, Ajax, Oakville, Aurora, Newmarket, and Barrie. 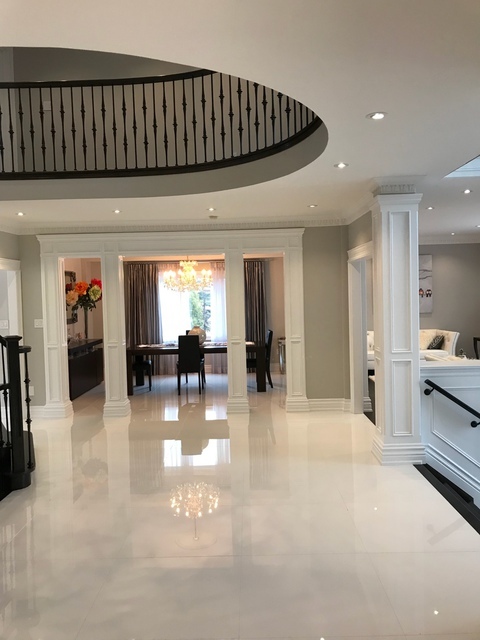 Maestro Mouldings specializes in installing crown mouldings, flexible mouldings, wainscoting, baseboards, casings, medallions, columns and coffered ceilings. WE CAN MATCH ANY PRICE FOR ANY OF OUR SERVICES. A Maestro is a great or distinguished figure in any sphere. In the field of home decor, we are truly the maestros that bring you quality, originality, and monumental mastery. Maestro Mouldings was established out of our devotion to excellence, perfection, and superior craftsmanship. Simply put, we stand out from our competitors because we love what we do and we do it with a passion! With many years of experience under our tool belt, we offer our services to our clients in all three sectors: residential, commercial, and corporate. Because we are confident that you will be pleased with our services and results, we extend a 100% satisfaction guarantee. Not to mention the fact that we can beat any price on the market. No wonder we are used to standing ovations! crown mouldings, flexible mouldings, wainscoting, baseboards, casings, medallions, columns and coffered ceilings.